GREETINGS TO ONE AND ALL!! Livity Creations produces and distributes clothing inspired from Rastafari, Black music and African Culture. Clothing for all seasons with attention to styles of models and quality of materials. have a look at our stuff, catch the vibe and if there is something you are interested in YOU CAN ORDER DIRECTLY HERE through Facebook, or using our email address LIVITYCREATIONS@GMAIL.COM ...or if you prefere call 0039 3473231299 . Just let us know the items using the model name, link or by attaching a photo and the size and colour. We will get back to you with prices and shipping costs. It's also possible to receive the "LIVITY CREATIONS Complete Catalogue" in your email... just contact us and we'll send it to you !! 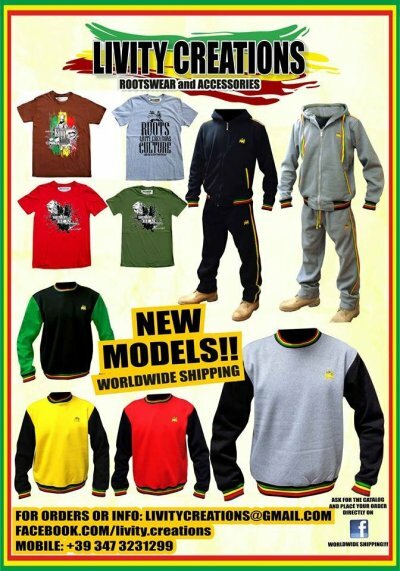 Livity Creations produce e distribuisce abbigliamento e accessori ispirati allo stile di vita Rastafari, alla Reggae music, Black Music e African Culture. Capi per tutte le stagioni con attenzione allo stile dei modelli e qualità dei materiali. Vendiamo all'ingrosso e al dettaglio con.. SPEDIZIONI IN TUTTO IL MONDO!! Basta indicarci il nome o codice del modello ( o allegare il link), la taglia ed il colore...noi vi rispondiamo subito con prezzi e disponibilità. E' inoltre possibile ricevere il "LIVITY CREATIONS Catalogo Completo" direttamente nella vostra email... contattateci e ve lo mandiamo subito!